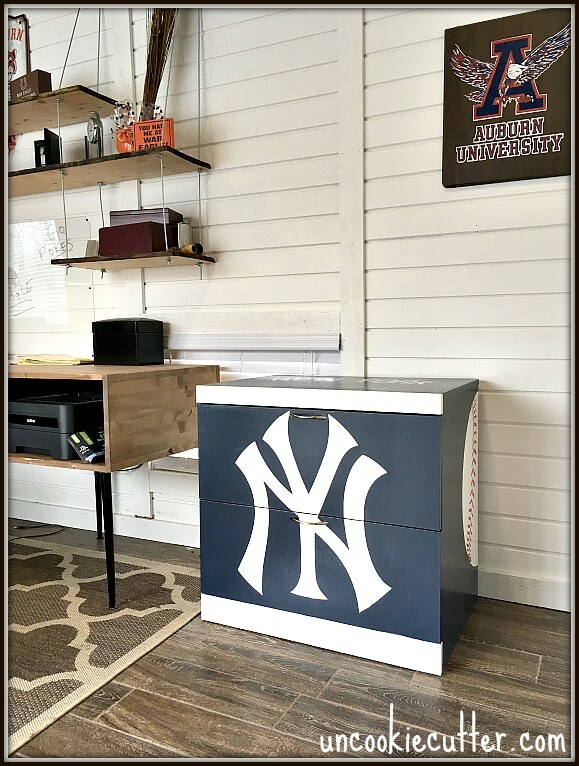 File Cabinet Makeover for the Yankees fan! Hello and welcome back! 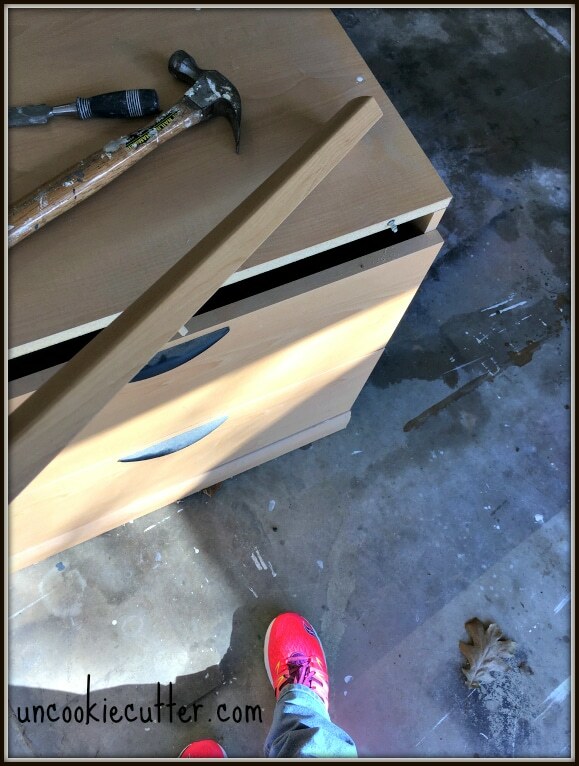 If you’ve been here awhile, you may remember my husband’s home office makeover from last year. 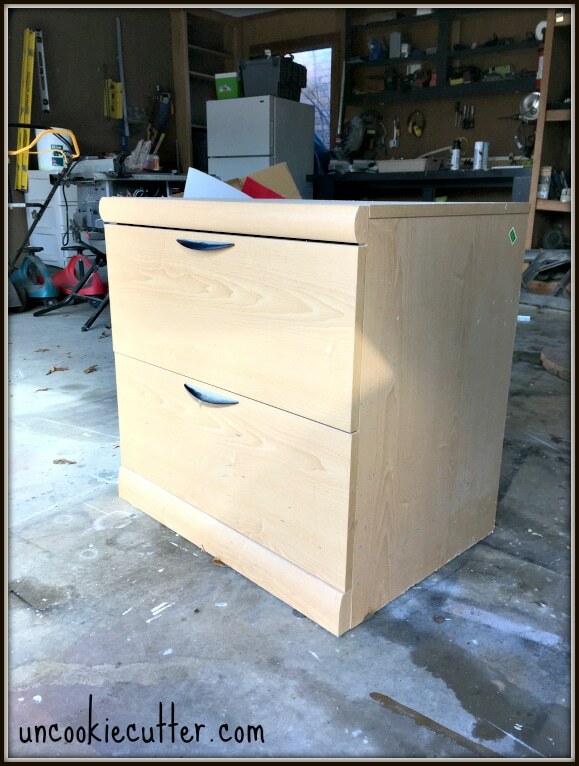 Ever since I finished that massive project, there has been an important piece that needed to go back into the room that I just didn’t want to work on – the file cabinet. 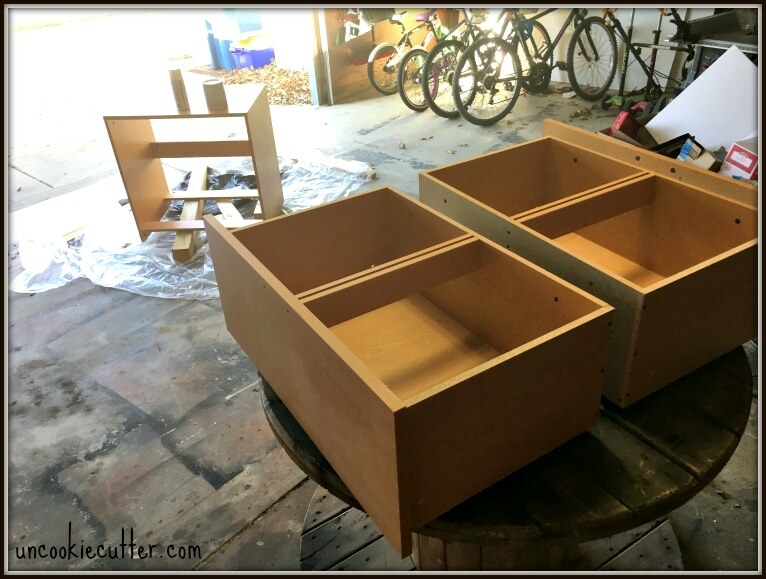 It was ugly, I hate filing and I would much rather build a piece of furniture than re-finish one. 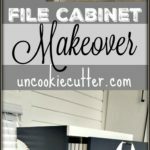 So, when I found out that the Silhouette Challenge this month was “organization”, I thought this was the perfect opportunity to get on the ball and get this file cabinet makeover underway. So, here is what I was dealing with. A totally outdated 80s file cabinet – and not the awesome kind of 80s. I started by ripping off those curved pieces at the top and bottom. I threw those out and then dis-assembled the drawers. I always take pictures when I’m taking something apart I know how to put it back together. Once i got it all part, it was time to prime. 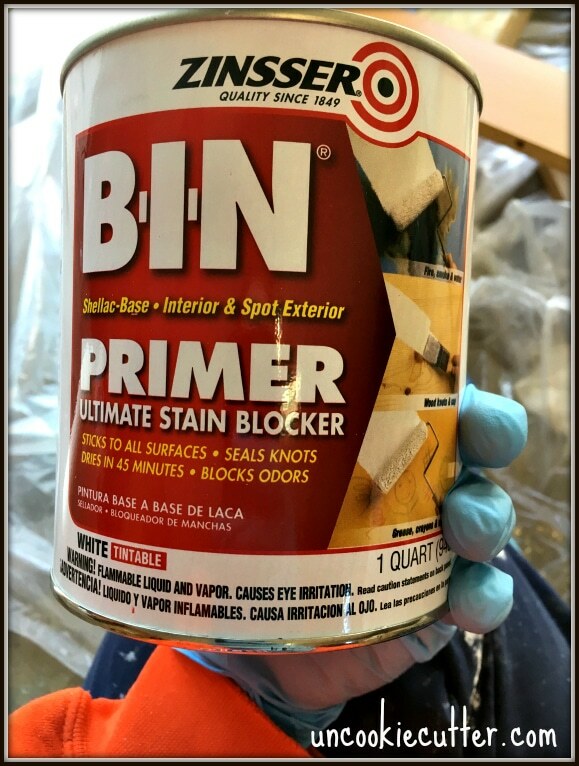 I used this good stuff to prime right over the laminate covered particle board. I love all Zinsser products, I have always had to luck with them and this stuff was no exception. I slapped on a coat without any sanding and it made it ready-to-paint. After the priming was done, I painted everything white and it was time to design. My husband loves the Yankees. He grew up in Southern Indiana, specifically in Don Mattingly’s hometown where he and his fathered followed along as he rose up through the ranks. I have loved the Yankees ever since I watched a baseball movie on HBO about Mantle and Maris called 61*. 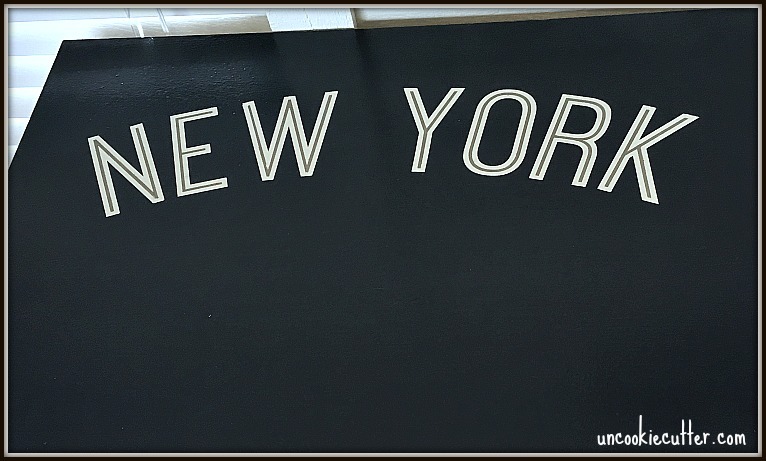 The history of the Yankees is such an American classic and not only that, but I love the “look” of the Yankees – the logo, the Pinstripes, the image. I love it all. 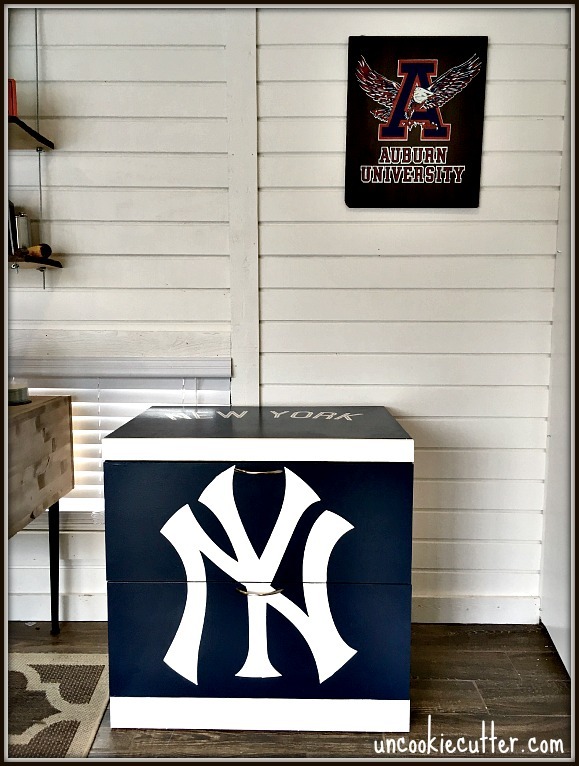 So, I decided since we had a bit of a sports theme going on in his office, I would do this file cabinet up Yankee style. 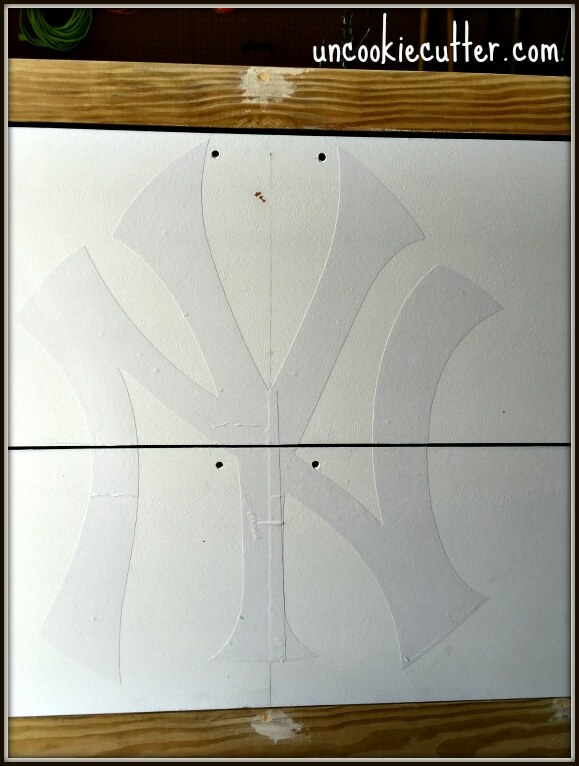 I started doing pinstripes on the inside of the drawers. Remember when I said I love Pinstripes? I LOVE them. Not sure why but they just make me happy. 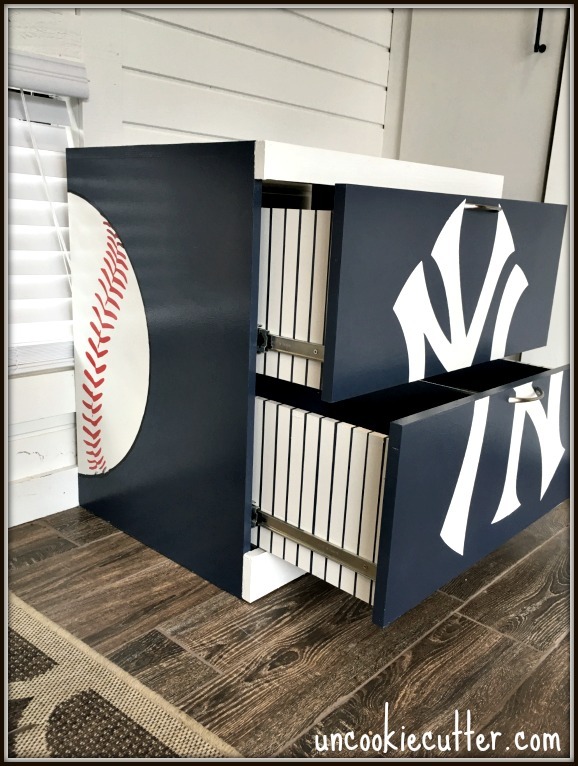 So, I did some Pinstripes on the inside of the drawers. The traditional Yankee pinstripes are about an inch apart and about 1/16th of an inch thick. Mine turned out a little bigger, but no biggie. I painted it white first, then measured out and put on the painters tape. Make sure your paint is completely dry first. Like, a couple days dry. I used a tape that was one inch thick to make it a little easier. 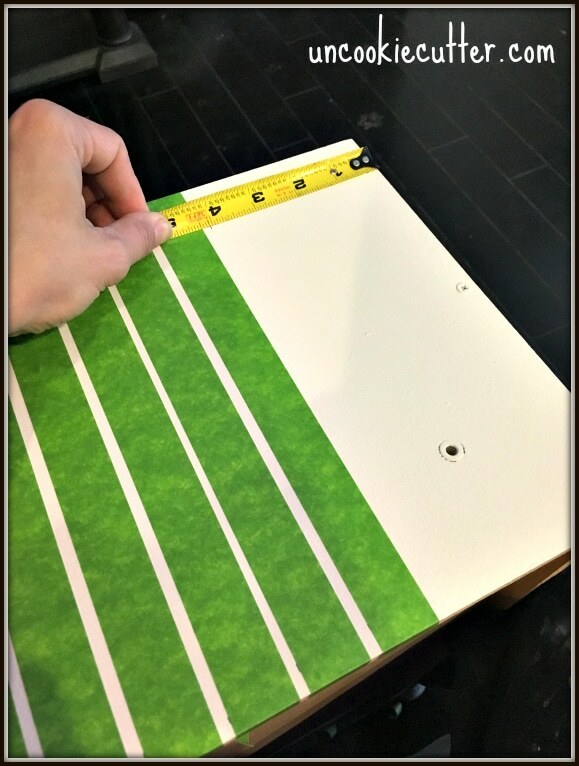 Here is a little secret on how to get your painted stripes perfect. Paint over the lines in the base color first. 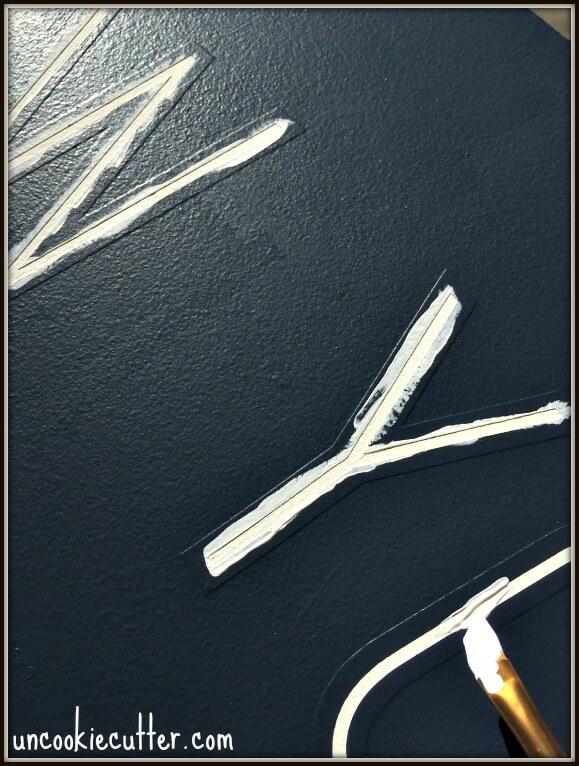 So, I painted over these lines with white. This allows for any bleed through to happen with the white. Then, after that had dried, I painted on the blue. Viola! Perfect bleed-free stripes. Now here is where my silhouette came in. 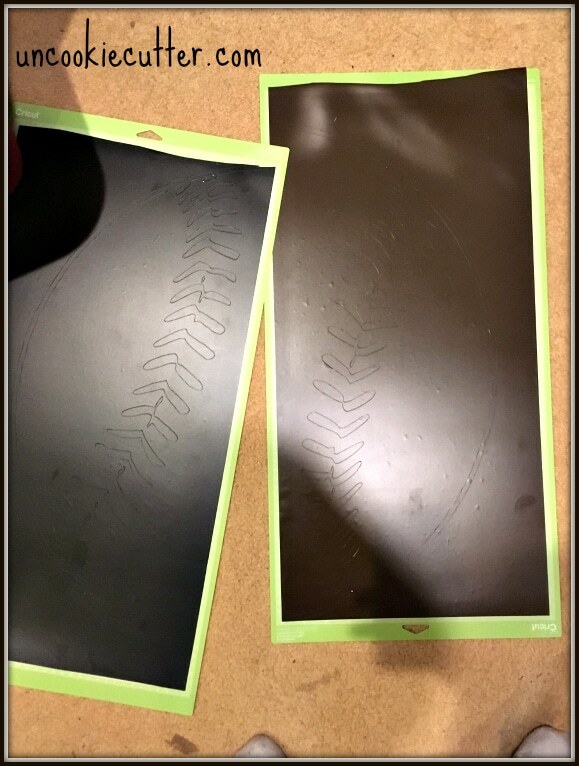 I found a generic baseball image and printed it out on a long stretch of vinyl. I put one of each side of the cabinet. Then, using the same technique as above, I painted over it with the base color -white. Then, I painted the stitches red and the rest of the cabinet in blue. On the top I wanted the “New York” logo. I couldn’t find the exact Yankee logo font, so I used the closest I could find which was ostrich sans inline. This took some detail work. The inside is gray, so first I put the letters on and painted over them in white to prevent bleed through. Then, I painted everything blue. Then I took off the innermost cutout of each letter. I painted white again, then gray. Then, I pulled off the rest of the vinyl, leaving the white. After I finished all that, I wanted to put the traditional logo on the front of the cabinet, nice and big. But first I had to replace those ugly boards I took off at the beginning. 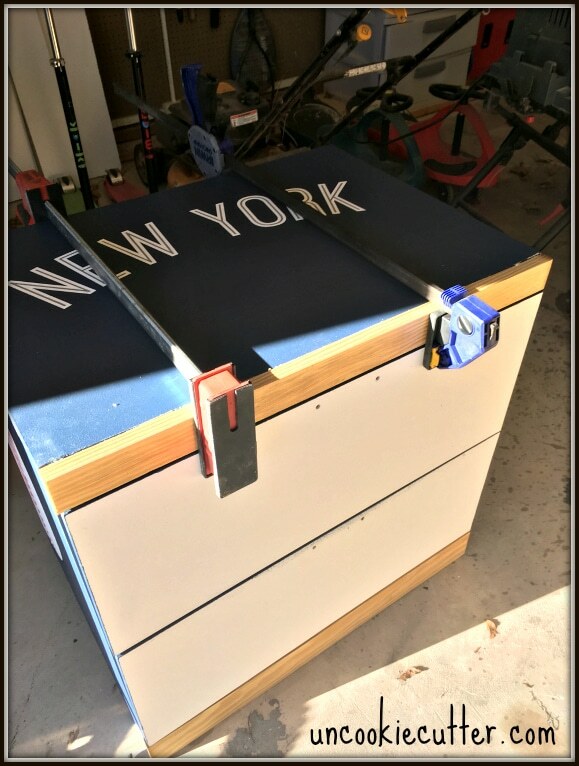 I covered the cabinet shell and inside the drawers – where the pinstripes were and the actual inside of the drawers with Polycrylic. Then I reinstalled the drawers so that I could make everything fit perfectly. I replaced the old boards with just some straight, regular 1×4 scraps that I ripped down to the correct size. I used wood glue and countersunk screws to attach them to the cabinet. Now time for the big daddy logo. I had to use two more long sheets of vinyl for this. Since this vinyl isn’t staying on, you can really use whatever cheap stuff you can find. I sized the image, then cut it in half. I deleted the second half and printed the first half right on the edge of the sheet of vinyl. After I printed it, I pressed “undo” to bring back the deleted half and then deleted the first half and printed the second half on another sheet. Then I just lined them up on the front of the cabinet together. Then – you guessed it – painted over it in white (have I mentioned bleed through?) and then blue. I originally painted the top and bottom board blue but wanted a little more definition, so I ended up changing them to white. 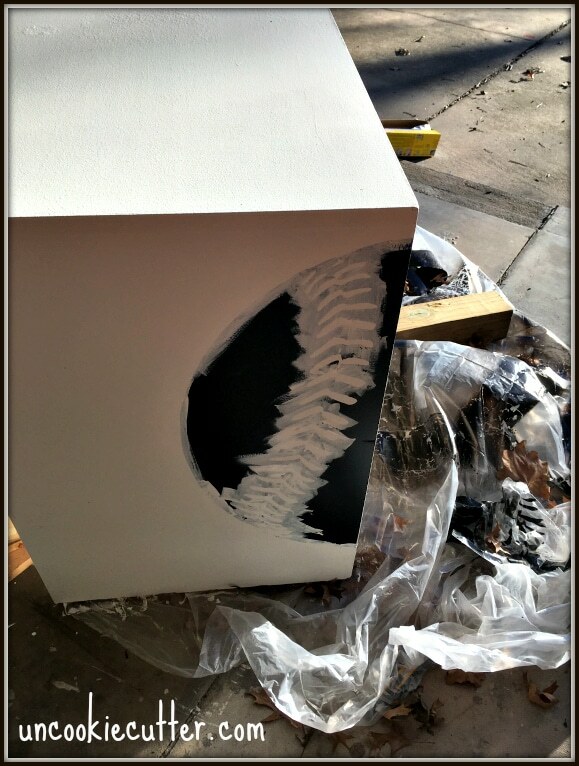 Then I painted over the front with two coats of Polycrylic and drug it inside. 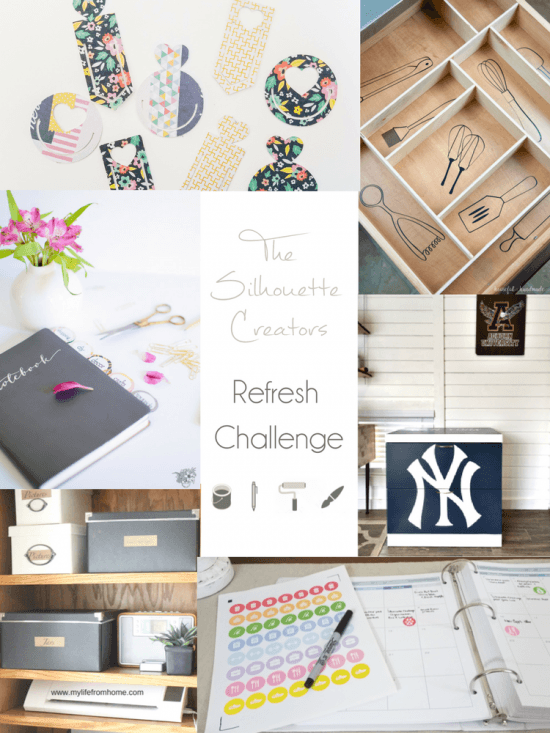 Need even more inspiration on how to stay organized with your silhouette machine? Check out these amazing projects my friends did with their machines. Organization made pretty! Make sure to come back next month to check out what we all do with our Silhouette machines and the theme “spring fever” which has me so excited cause it means winter is almost over! 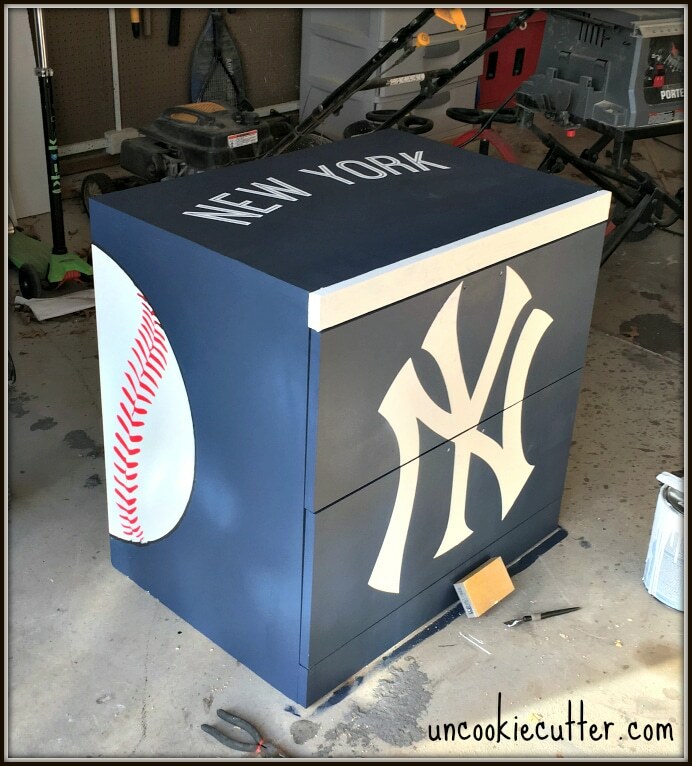 Your husband’s file cabinet looks AMAZING! Seriously! I what a fun way to make a boring job a little more exciting. Pinning! Thank you so much Cat! I had fun with this one :). Thanks for hosting! Wow! You did an amazing job on this. It looks very professional and I am really loving the stripes on the sides of the drawers. What a great touch! April, this is amazing! I love all of the thought and detail you put into it! That’s a great project! 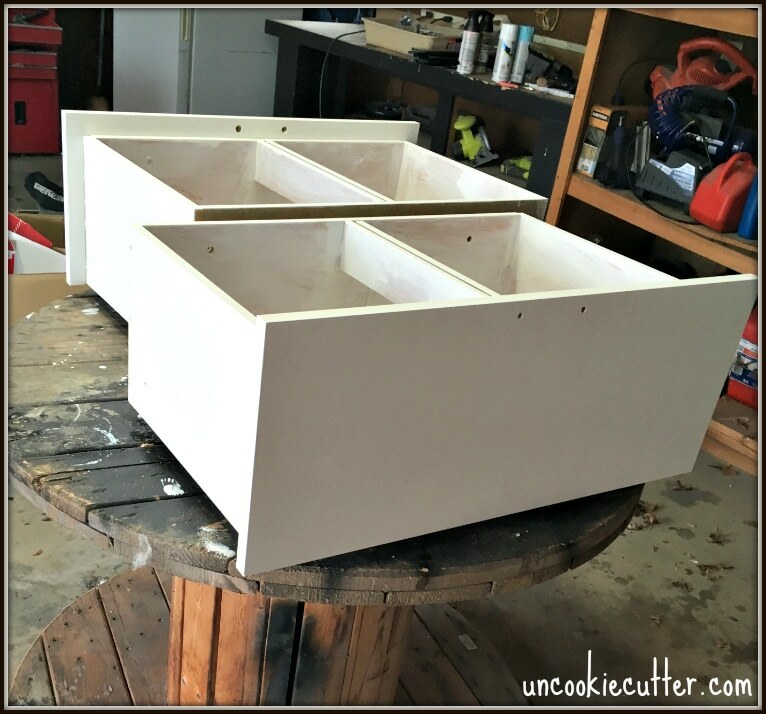 I have an old wooden file cabinet similar to that, and it gives me ideas of ways to make it over for my hubby. Thanks for the inspiration! Of course! I love a good logo, is that weird? haha, thanks for stopping by Regi! It looks amazing!! Love all the details you added!! I guess your husband is super proud of you right now… I could have been a Valentine’s gift too. It would be awesome if you share it at Sweet Inspiration party! Have a wonderful weekend April. I’ll head over now! Thanks Pili! This is great! A lot of work, but looks like a masterpiece! This turned out so awesome! Those pin striped drawers are my favorite. And it looks so much better than before. April this is super awesome. And I’m not even a Yankee’s fan and I still say it is awesome. Lot’s of work but now you have a one of a kind piece you can be proud of. I bet your husband must be thrilled.